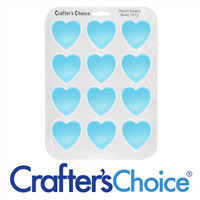 COMMENTS: I love ALL my Crafter's Choice silicone molds! These are awesome, & the only thing I was missing for my collection of silicone molds. COMMENTS: These are perfect for making guest size soaps but I also like to you them for making test bars...works perfectly and I use much less materials. And soaps remove without any problems. Saving up to buy another set. • Do not care for the heart mold. "I love to have all these molds and test them"
COMMENTS: I love to have all these molds for different uses.